( December 17, 2015) Oh such a nice surprise to come across this page. I used to work at Staves. It was not Company just a canny one man show and he used the name Stave because it was musical and Henry because it sounded very English. He had an unpronounceable Jewish name.He was a wonderful eccentric and it was like working in a mad house but great fun.Love to hear if you have any memmories of shopping there. Comment: Daphne Morgan. Name Peter Mechen Comment: Golly! Wonderful information concerning Henry Stave and Company! To think I bought LPs from him to post to New Zealand for about six years and didn't know anything of what Daphne Morgan has said - I simply assumed it was a kind of efficient, faceless record shop with a mail order department. Henry Stave was VERY efficient as well as being very kind, because he used to either replace or refund LP which weren't perfoect and which I set back to him (this was in the days when postage was cheap - nowadays postage firms charge like wounded bulls!). 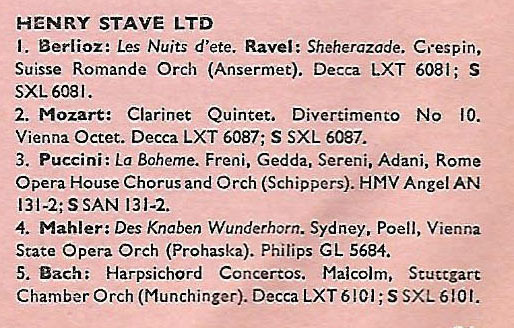 I have the most pleasant memories of dealing with Henry Stave, and most of the LPs in my collec tion dating from 1969 to 1975 come from that shop! I finally got to London in 1994 and worked there as a teacher for a year - sadly, when I went to No.9 Dean St. there was no sign of Henry Stave. I was so disappointed! I wanted to thank someone - anybody! - who had perhaps been there during my halcyon record-buying days for all the pleasure I'd got from those packages of LPs sent to New Zealand! (June 18, 2017).